From The Kohala Mtns. 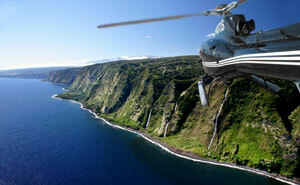 To The Active Volcano Inc, The Hamakua Coastline, Flight time approximately 2 hours. Will pick up at most locations in Kona Experience the fiery lava vents of the Big Island's active volcano, Kilauea. The intensity of the live volcanic landscape will surely take your breath away. This is just one of the unique sights you'll find on an island boasting 11 out of 13 climate zones present on Earth. Let our Black Beauties whisk you through the hidden tropical valleys of the Kohala mountains, alive with dozens of roaring waterfalls, and lift you above the beautiful rainforest of the Hamakua coast.